NRC Chairman Jaczko speaks during the international conference. In the nuclear business the axiom is that an accident anywhere is an accident everywhere. In the time that has passed since the Fukushima Dai-ichi Nuclear Power Plant was overwhelmed by an earthquake and tsunami the nuclear community has seen again that nuclear communication is global as well. 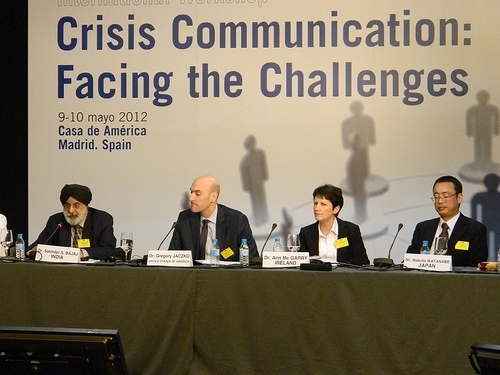 Last week, 170 national nuclear regulators, national nuclear communications executives, reporters from around the world, representatives of non-governmental organizations (NGOs) and others gathered in Madrid to discuss nuclear crisis communication – how to accomplish it in an era of instant communication and how to ensure that regulators attain and retain trust among the publics to whom they communicate. The first-of-a-kind session was organized by the Paris-based Nuclear Energy Agency (NEA) of the Organization for Economic Cooperation and Development (a post World War II reconstruction agency), and sponsored by the Spanish nuclear regulator, Consejo de Seguridad Nuclear. What gave weight to the meeting was the heavy presence of top national regulatory leaders. They came from the United States, France, England, Switzerland, India, Japan, Spain, Korea, Hungary, Russia, Austria, China, NEA, OECD and the U.N.’s International Atomic Energy Agency. It was preceded and followed by meetings of a group of nuclear communicators from a variety of governments constituting the Working Group on Public Communication under the umbrella of the NEA’s Committee on Nuclear Regulatory Activities. And the starting point for discussions was the WGPC’s Roadmap for Crisis Communications . For the United State’s part, NRC Chairman Gregory Jaczko moderated a panel on lessons learned from past crises. Panelists included the regulatory chiefs from India and Ireland, a top communications executive from the Spanish CSN, and a senior Japanese official who discussed their Fukushima Dai-ichi communications experience. Summing up the session, Jaczko said that timeliness of communication is an element in effective crisis communication, that how an agency communicates can affect trust and credibility, and that it is important to quickly communicate what information is available, even if it is incomplete, because as more details become available communications can be made more precise. As the NRC’s Director of Public Affairs, I made a presentation on the use of social media in crisis communications, making the point that in an era of tweets, governments must adapt to the new social media tools to keep the public informed. I described how useful the NRC’s blog was during the Fukushima plant accident and catalogued the use of social media among other nations. The two days of sessions were webcast. Chairman Jaczko’s opening remarks are available on our YouTube channel. Archived webcasts of the entire program are also available. can be found here. This was the start of a long-overdue dialogue on global nuclear communications in general and crisis communications in particular, and kudos to the NEA for organizing the sessions and the CSN for hosting in Madrid, one of the world’s beautiful cities. Next stop – Vienna, Austria, in June when the IAEA convenes an International Experts Meeting where the United States will have the opportunity to brief the IAEA member nations on the NRC’s approach to communicating with the public. Communication is now clearly both instant and global, and a regulator’s comments anywhere can reach everywhere. I am Glad Spainish Goverment decided to take advantage of social media sites such as twitter and facebook. It is proven to help to keep people involved in their goverment issues and in turn can only strenthen community morale. This is a good step forward for spain!